We get pretty much excited when we get to see cosmetics in the sweetest packaging, and Too Faced's signature heart shaped blushers are probably one of the cutest designs you can find. These original heart shaped blushers finally come in miniature size in this limited edition Christmas Gift Set, which is the perfect gift for yourself and your girlfriends! The Too Faced Melted Kisses & Sweet Cheeks ($50) comes with three sets of Sweet Cheeks blushers and Melted Kisses lip glosses. 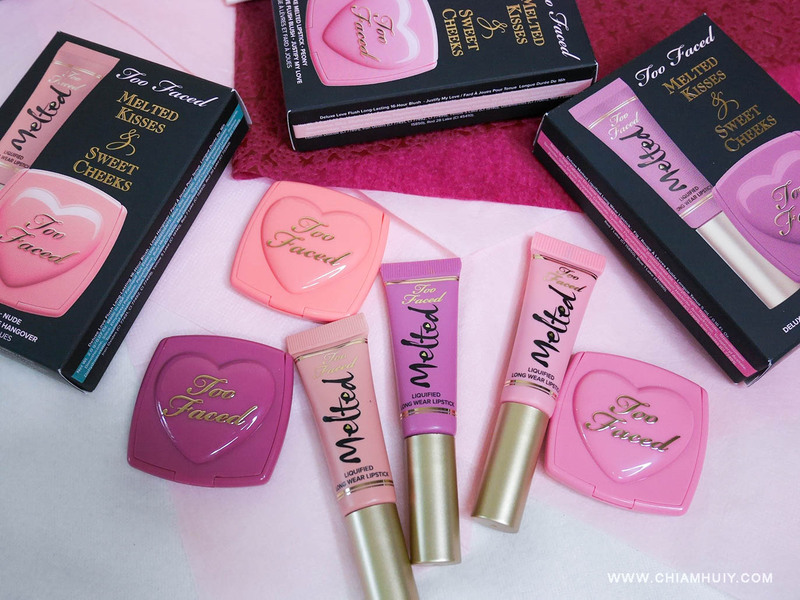 And because the Too Faced Melted Kisses & Sweet Cheeks ($50) are packed individually into three sets, you can easily 'dismantle' this gift set and give it to three friends of yours! Speak about economic sense (lol). 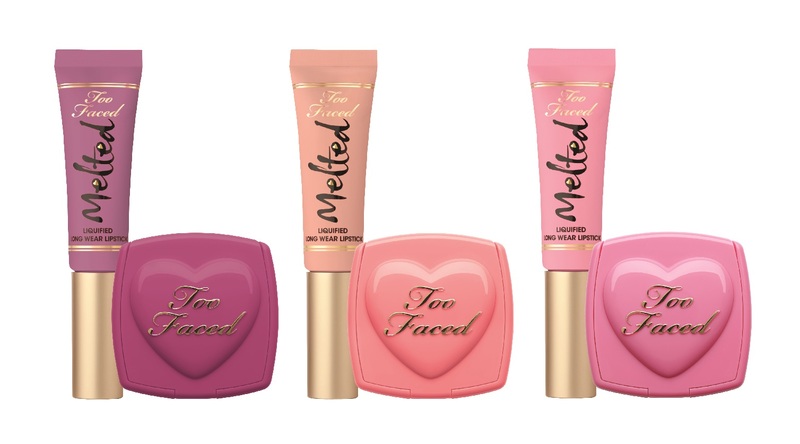 The three color themes in the Too Faced Melted Kisses & Sweet Cheeks gift set are wine, coral and pink. 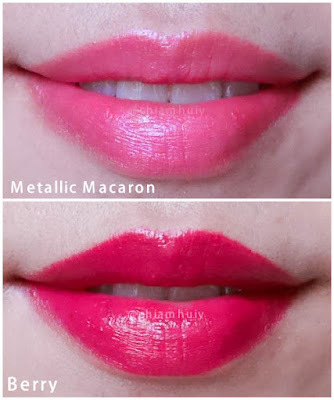 I thought it's quite nice to pair the blushers and lip glosses together according to their color so that you can easily bring a pair out to match your cheek and lip colors. These small blusher miniatures are definitely easy to bring around for a quick touch up in the middle of the day. Too Faced Melted Kisses lip glosses come in felted tip which makes it easy to spread across lips, even chapped lips. It's very moisturising and it applies across the lips very flawlessly. Below are two swatches I did using Too Faced Melted Kisses lip glosses from another Christmas gift set (French Kisses Melted, $35) from Too Faced. 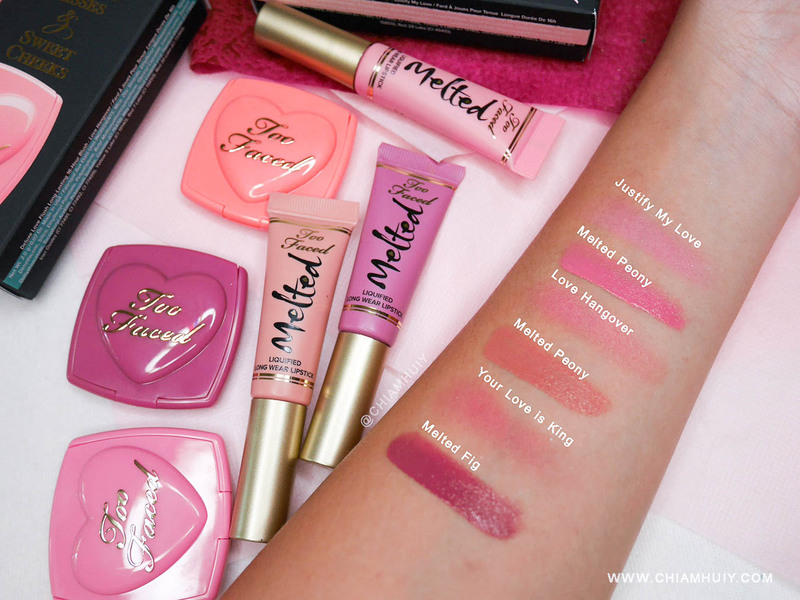 Find Too Faced Melted Kisses & Sweet Cheeks (S$50) at all Sephora Singapore stores from today onwards!